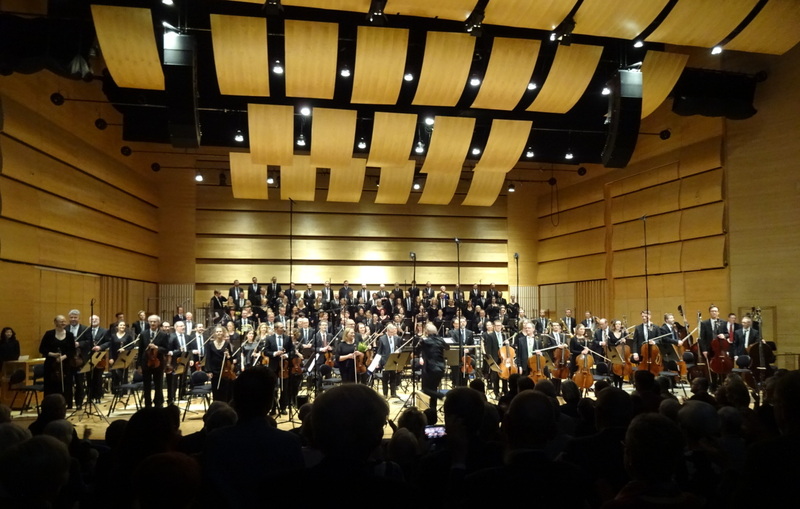 On Saturday afternoon, the 16th of March, the performance of the 12th Symphony „De döda på torget“ after Pablo Nerudas Canto General took place. No other work was combined with this unique vocal symphony which needs not only an one-hour space in the concert but full concentration and much time to prepare in the rehearsals. It was good to see that many people wanted to listen to this extraordinary symphony – the concert hall Louis de Geer was nearly sold out and it was also a very good audience atmosphere during the concert as long as one could notice the overwhelming, captivating feelings which were going out from Petterssons music. To make this happen, Christian Lindberg did well prepare both the choir and the orchestra who have an immense task considering that strings and the choir only have few empty bars to breathe until the next waves start to roll. Lindberg gave also much attention to the balance of dynamics to give the symphony increasing intensity by a constant flow. The first two songs could emphasize a kind of introduction atmosphere, therefore the repetitions of „straff“/“punishment“ and the portraits of the workers called by their names again and again got an immense power. It was fascinating to see that both of the choirs got close to their limit – which is admittedly Allans fault and demand at the same time – but the voices never got over the line of the streaming of the notes.